Adapted from an article published in the Red Rock Rag, Volume 2, Number 11: November, 2001, with major revisions incorporating information provided by geologists Richard Lippoth and Jack Murphy. Manitou’s Redstone Castle may have been built as early as 1874 from stone which probably came from Red Rock Canyon. (Different dates have been given in different sources.) But, it was not until 1886 that the canyon saw extensive and well capitalized quarry operations. 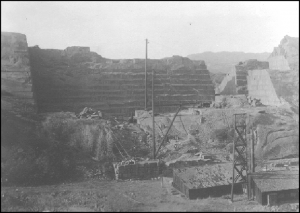 In 1888, the Colorado Stone Company and the Snider Stone and Lime Company both began quarry operations in Red Rock Canyon. Snider Stone and Lime, which was operated by the Snider brothers of Manitou, had quarries within a half mile of Fountain Creek. Further up, just above the junction of Red Rock and Greenlee Canyons where the lakes are located now, the Colorado Stone Company had a smaller quarry. In contrast to the simple low cost technology used in the Bott quarries, these Lyons sandstone quarries in Red Rock Canyon employed expensive machinery. Since the ridge which was quarried is a large competent mass of stone, quarrying involved cutting the stone rather than cleaving it. For each large block of stone quarried, channeling machines which rode on temporary rails made cuts along each side of the block; holes were drilled beneath the block; and black powder was detonated in these holes to break the block loose from the underlying sandstone. In 1888, two of the quarries employed steam powered machinery. The Colorado Midland Railroad ran a spur into Red Rock Canyon with sidings serving each of the quarries, probably in 1889. Once the quarries were served by the railroad, blocks of stone were loaded onto a railroad car by derricks. The large derrick at the Kenmuir Quarry was reported to be the largest in Colorado. By the end of 1889, only two companies still operated their Red Rock Canyon quarries. The Greenlee operation employed 120 men and shipped 10 carloads a day while Snider employed 35 men and shipped 5 carloads a day. 1890 shipments were over 42,000 tons. Because of the color and uniformity of the Lyons sandstone and the ease with which it was cut and carved, stone from the Red Rock quarries had an almost nationwide market. Anticipating growing and continuing demand, the Greenlees leased Section 16 for possible expansion of the Kenmuir Quarry. In 1894, the Snider Brothers’ stone quarries were sold to C. E. Durkee and J. F. Seldomridge & Sons. The buyers apparently did not continue quarrying operations. The Greenlee quarry operation was continued until sometime between 1909 and 1915, and was probably discontinued because of declining demand. 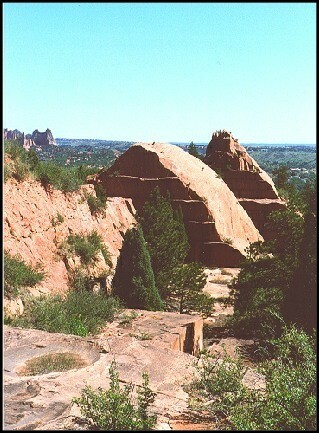 Lyons sandstone from Red Rock Canyon can be seen in various buildings in the Pikes Peak Region and in Denver. In Manitou Springs, it was also used for Red Crags, the two round spring buildings on Manitou Avenue, and elsewhere. Because of the premium price of this stone, it was sometimes used only for architectural accents in buildings built of less expensive Dakota sandstone or brick. Today, buildings of Red Rock Canyon sandstone show that the soft stone which cut and carved so readily has not resisted weathering well.